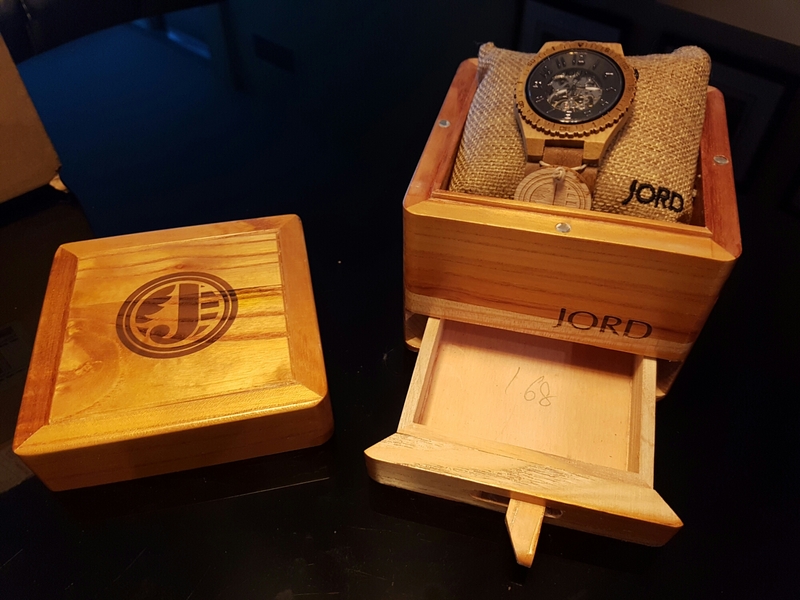 JORD watches: Because dad gets to look good too! Well I don’t want to be known as a men’s watch enthusiast, but anyone looking at my bedside table wouldn’t guess that. They’re all there, from the Tasmanian Devil wearing a Miami Dolphins jersey analog that I got when I was way to young to tell the time on an analog watch to the digital with a TV remote control in it. Bands of leather, metal, plastic, cloth… wood? My newest addition is by far the most unique watch in my collection. 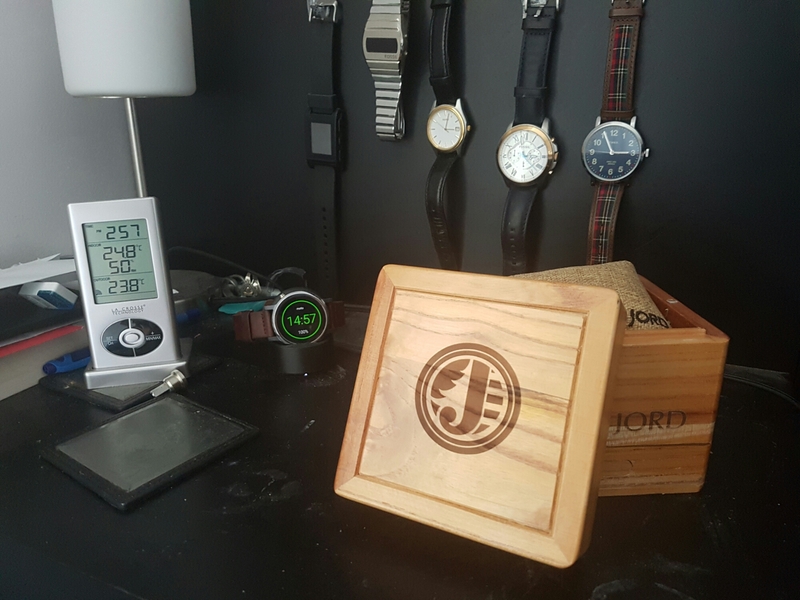 My JORD Dover series arrived in the mail today, and I loved it the moment I opened the package. Inside the cardboard packaging was a beautiful wooden box. Right away you could tell that quality is a staple for the company. The secret drawer in the bottom is a clever addition as well. Read to the end, it’ll be worth your while!! The watch itself is stunning, and surprisingly light weight. 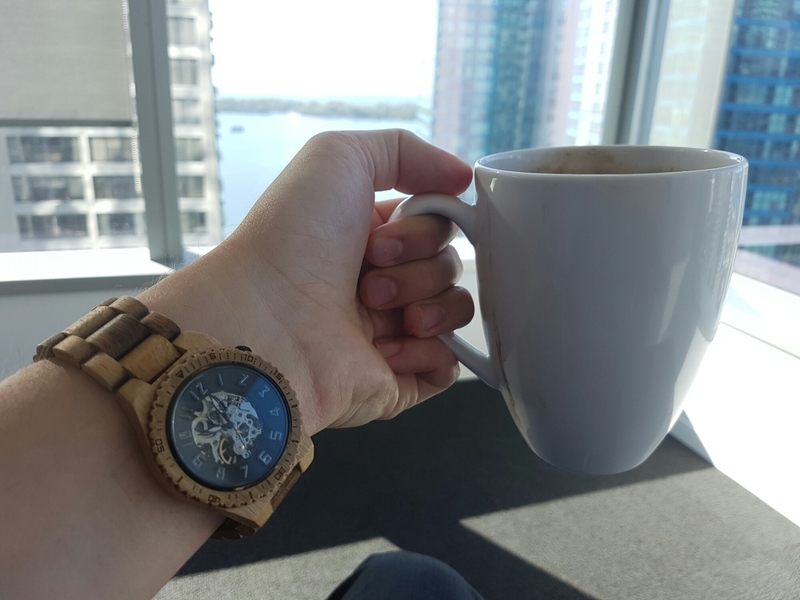 I’ve seen wooden watches before, but it felt like you were carrying around a tree trunk everywhere you went – I’m sure you can imagine how uncomfortable that would be. But as I type this, I can barely notice the weight of it on my wrist. I can’t get enough of the exposed mechanics, silently whirring away the time. I was a little surprised that the watch was running when I received it. The self-winding automatic drive system has no battery, and holds a power reserve of 36 hours. Clearly the slight movement in shipping was enough to keep the watch running all the way across the border and to a different time zone. Of course the time zone change meant I had to adjust the time on the watch. It took me a minute to figure out, but after a variety of tests I found the winding and time adjustment crown was designed just as uniquely as the rest of the watch. three counterclockwise turns and the crown springs out, allowing you to wind the watch. A little tug from there and you can set the time. Push it back in, give it a couple clockwise twists (winding the watch), and you’re all set. Beautiful, and you won’t accidentally pull the crown and change the time. As the leaves are turning and sweaters are getting dug out from the basement, this watch really completes my fall style. Keeping it casual in jeans, or stepping it up in a suit – this watch is going to look great, no matter what the combination! Check out the entire catalogue here, and spruce up your collection with a cool watch today! My Dover watch was provided by JORD Wood Watches for this review, but I stand by every word of it. Want one of you own? 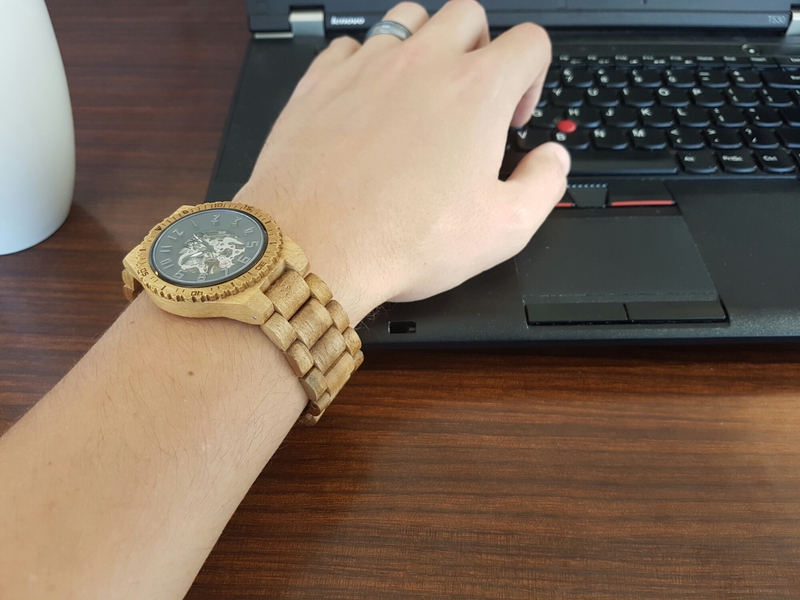 “> Enter HERE for a chance to win a $75 e-voucher towards your new JORD Wood watch! All entrants who don’t win the grand prize will receive a $20 e-gift card that can be used toward their purchase. Contest ends October 30th, so get to it!